Stephaniesid, the former group of prodigiously talented singer Stephanie Morgan, had a kind of arty pop sound with the added interest of a strong jazz sensibility. 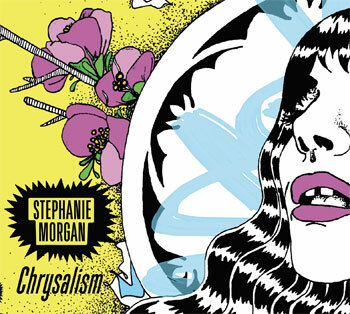 Since the end of that project, Morgan has ventured out on her own, and, while Chrysalism should please longtime fans of her old band, it represents a decisive break from the past. More straightforward melodic lines are the order of the day, and the textures Morgan chooses to support those melodies — eerie Mellotron choirs on “The Minor Calling,” a shuffling disco beat on “I Hear a Symphony” — suggest that she’s found a recipe that allows her to pursue her ambitious ideas within a widely accessible musical framework. The minimalist instrumentation of “Bones” is a model of subtlety, while “Easy” — built upon a simple enough musical foundation — manages to evoke the combined effect of Southern gospel, blues and jazzy torch songs, all in the space of just over four minutes. There’s an underpinning of sadness, melancholy and resignation to many of the song arrangements, but that ambience is leavened with a sense — in the form of Morgan’s vocal delivery — of indefatigable optimism. Midway through the record is “In the Sunlight,” which — while not disavowing the more visceral emotions explored on other cuts — suggests that Morgan has charted a path forward and is supremely equipped to succeed in her ongoing journey. “Stardust” has a vibe that’s so unadorned and up-close that it’s almost uncomfortable listening, but Morgan somehow makes it work. In “This One,” she implores, “If you want to listen to one of my songs, listen to this one,” but anyone drawn in by Morgan’s expressive voice won’t wish to limit themselves. Stephaniesid is dead; long live Stephanie Morgan.